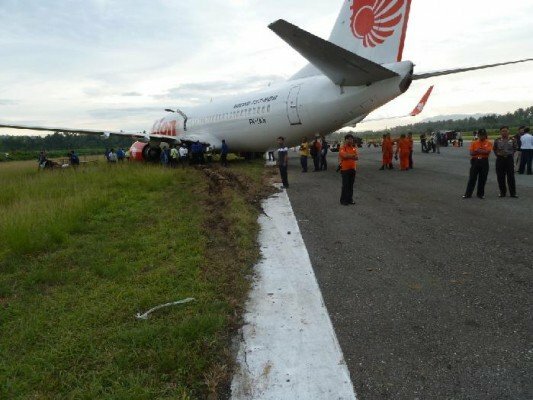 A Boeing 737-800 jetliner struck suffered a serious runway excursion incident after hitting two cows on landing at an airport in Indonesia, an investigation report shows. On 6 August 2013, a Boeing 737-800 aircraft registered PK-LKH, was being operated by Lion Air on scheduled passenger flight LNI-892 from Jakarta-Soekarno Hatta Airport to Gorontalo-Djalaludin Airport with an en route stop at Makassar-Sultan Hasanuddin Airport. The aircraft departed from Makassar at 20:03. During the flight to Gorontalo the Pilot in Command (PIC) acted as the Pilot Flying (PF) and the Second in Command (SIC) as the Pilot Monitoring (PM). There were two pilots and five flight attendants with 110 passengers on board. The flight from Makassar till the approach to Gorontalo was uneventful and the weather was fine. At 21:13, the aircraft touched down on runway 27 and during landing roll the flight crew saw some animals ahead were crossing the runway. At approximately 550 meters from the beginning of runway 27 and at a speed of 120 knots, the aircraft hit two cows. The pilots felt the brakes were ineffective and then the aircraft veered off to the left and came to rest on the left side of the runway shoulder at about 2,100 meters from the beginning of runway 27.
animals and stopped on the left runway shoulder and requested to check whether there was any fire on the aircraft and also requested assistance from the Airport Rescue and Fire Fighting (ARFF). The Djalaluddin Tower confirmed that there was no fire observed. The PIC informed the situation to the passengers and requested to remain seated and wait for further instruction. Some passengers evacuated the aircraft through right over wing emergency window without any instruction from the flight crew. Two passengers suffer sprained ankles, as a consequence of the evacuating. ARFF confirmed to the pilot that there was no fire on the aircraft, so the PIC decided to disembark the passengers via the right hand forward and aft service doors using rescuer stairs. Afterward two dead cows were found on the aircraft main landing gears. The aircraft hydraulic lines of the brake system and Weight on Wheel sensor were damaged as a result of the collision. – Some fences at the north and south of the runway along about 500 meters were broken and some parts were not installed with the fences. – The Djalaluddin Airport has been audited by The Directorate of Airport dated 11 July 2013 number: 016/DBU-IK/VII/2013, as the findings it found that: some Airport perimeter fences broken and the corrective action program did not perform. As such, This condition could be classified as extremely high since the findings issued till this serious incident occurred.